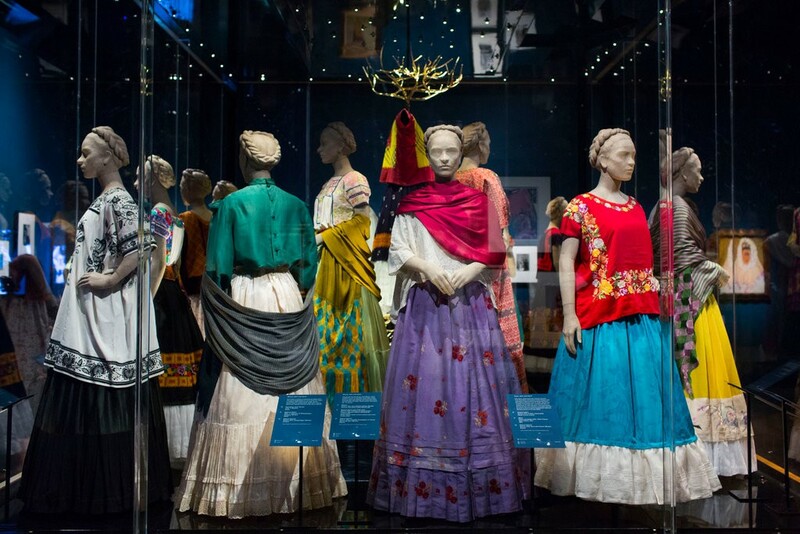 The exhibition at the Victoria and Albert Museum in London presented an extraordinary collection of personal artefacts and clothing belonging to the iconic Mexican artist Frida Kahlo. 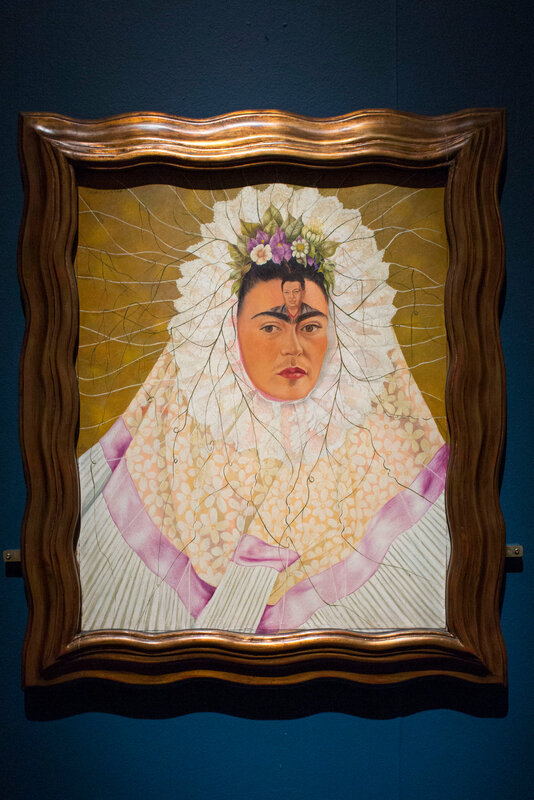 Locked away for 50 years after her death, this was the first exhibition of this collection outside Mexico. 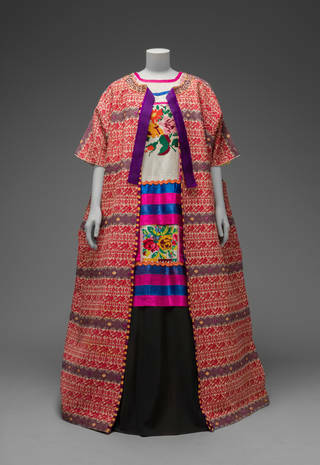 Clothes were more than just clothes to Frida Kahlo (1907-1954), the Mexican tyro of Surrealist self-portraiture. 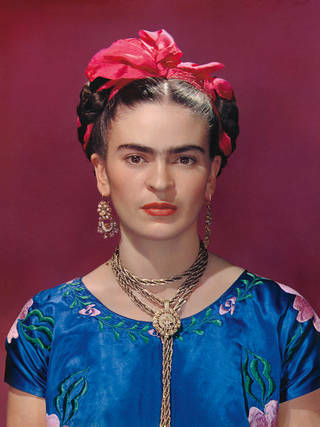 This should be underscored by “Frida Kahlo: Appearances Can Be Deceiving,” an exhibition — based on one by the Victoria and Albert Museum in London — which opens Feb. 8, 2019 at the Brooklyn Museum. 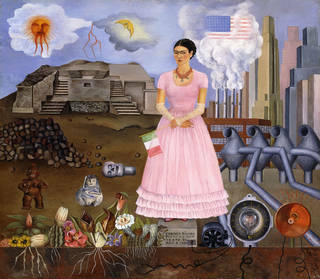 Self-portrait on the Border between Mexico and the United States of America, Frida Kahlo, 1932. 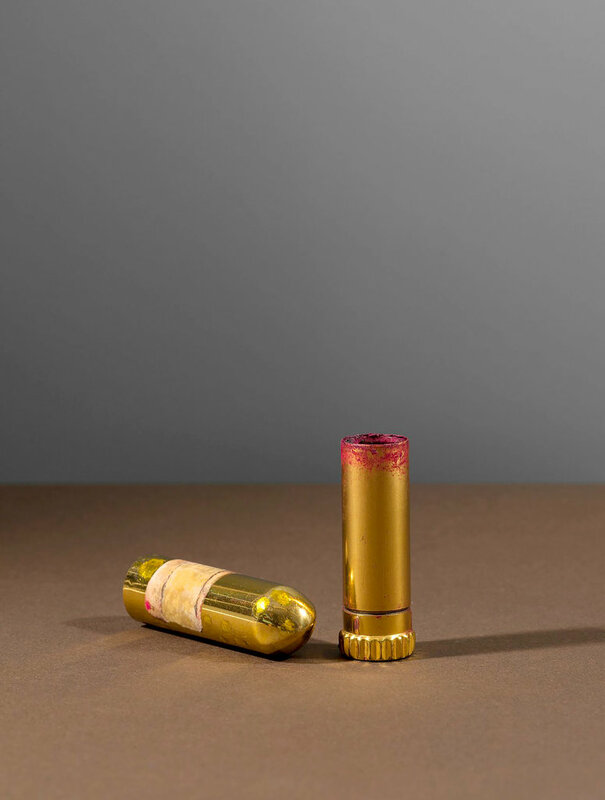 © Modern Art International Foundation, Courtesy María and Manuel Reyero. 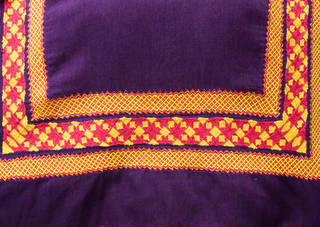 Cotton huipil with machine-embroidered chain stitch; printed cotton skirt with embroidery and holán (ruffle). Museo Frida Kahlo. Diego Rivera and Frida Kahlo Archives, Banco de México, Fiduciary of the Trust of the Diego Rivera and Frida Kahlo Museums Detail of cotton huipil with chain stitch embroidery, Museo Frida Kahlo. Photograph: Javier Hinojosa. Diego Rivera and Frida Kahlo Archives, Banco de México, Fiduciary of the Trust of the Diego Rivera and Frida Kahlo Museums. 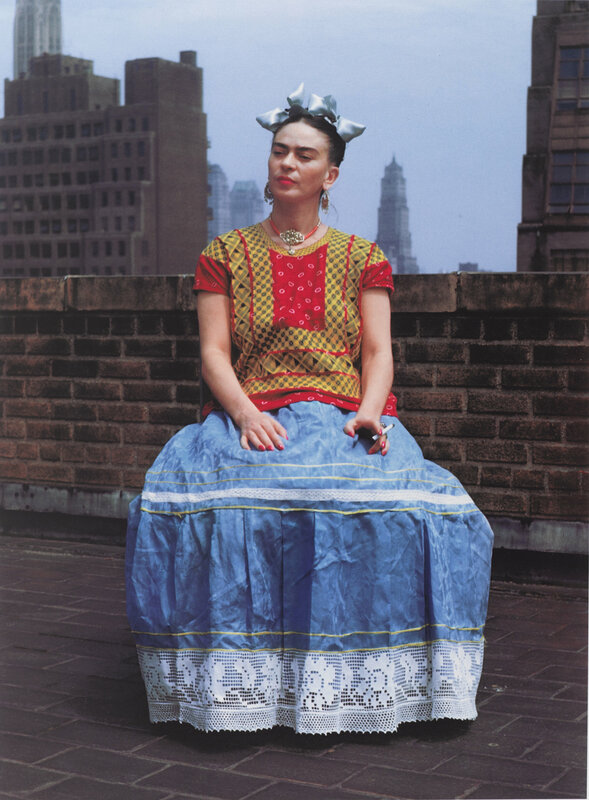 Frida Kahlo in blue satin blouse, 1939, photograph by Nickolas Muray. © Nickolas Muray Photo Archives. 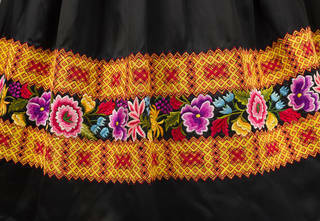 Detail of satin skirt with chain stitch and floral motif embroidery. Museo Frida Kahlo. © Diego Rivera and Frida Kahlo Archives, Banco de México, Fiduciary of the Trust of the Diego Rivera and Frida Kahlo Museums. 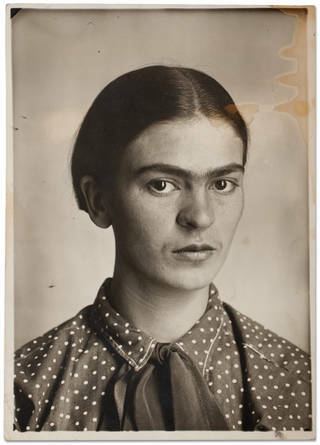 Frida Kahlo, c. 1926. 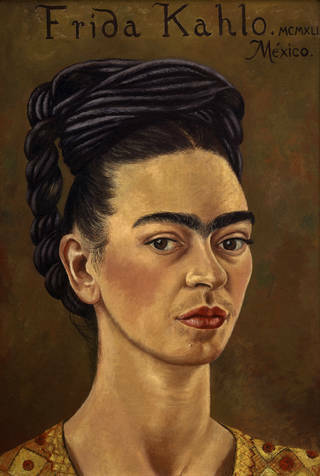 Image courtesy of Museo Frida Kahlo. © Diego Rivera and Frida Kahlo Archives, Banco de México, Fiduciary of the Trust of the Diego Rivera and Frida Kahlo Museums. 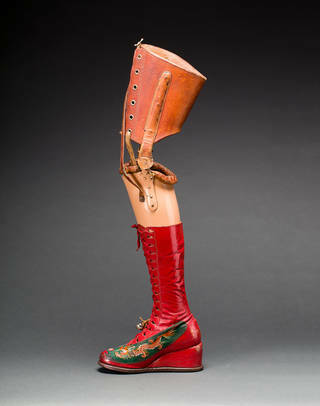 Prosthetic leg with leather boot. 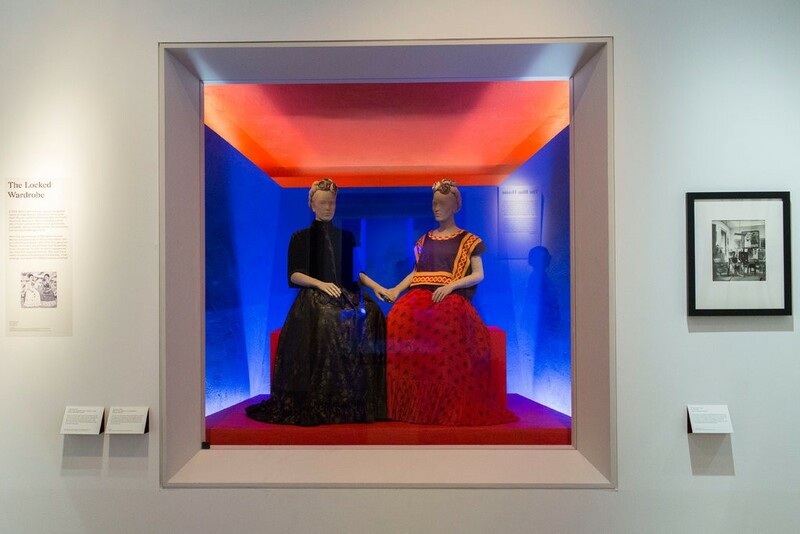 Museo Frida Kahlo. Photograph Javier Hinojosa. © Diego Rivera and Frida Kahlo Archives, Banco de México, Fiduciary of the Trust of the Diego Rivera and Frida Kahlo Museums. 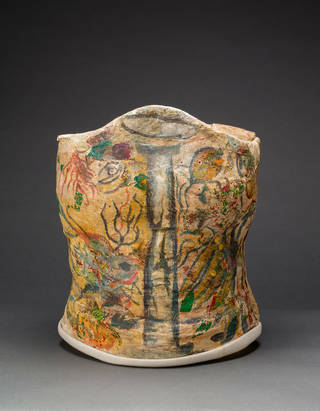 Plaster corset, painted and decorated by Frida Kahlo, Museo Frida Kahlo. © Diego Rivera and Frida Kahlo Archives, Banco de México, Fiduciary of the Trust of the Diego Rivera and Frida Kahlo Museums. 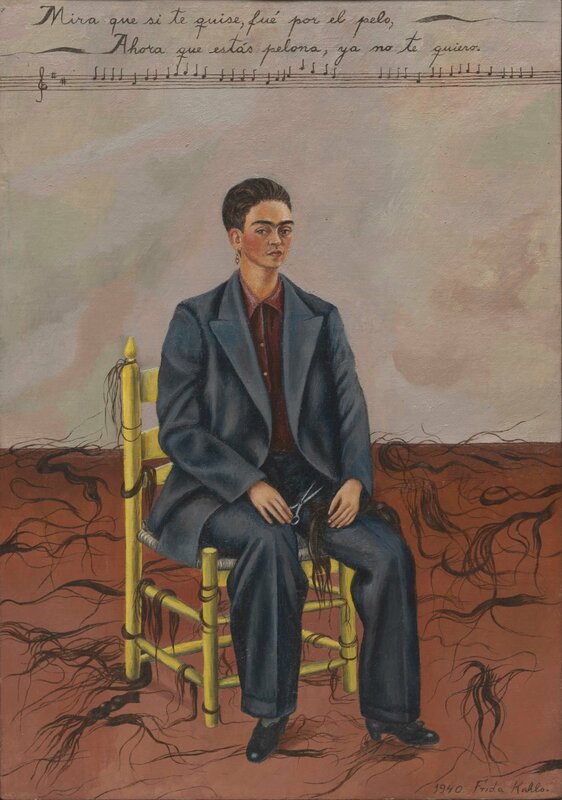 Self-portrait on the Border between Mexico and the United States of America, Frida Kahlo, 1932. © Modern Art International Foundation, Courtesy María and Manuel Reyero. Self-portrait with red and gold dress, Frida Kahlo, 1941. Courtesy of Gerardo Suter and The Jacques and Natasha Gelman Collection of the 20th Century Mexican Art and the Vergel Foundation. © 2018 Banco de México, Fiduciary of the Trust of the Diego Rivera and Frida Kahlo Museums. 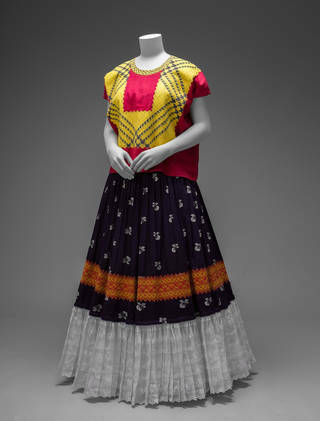 Scenes from “Frida Kahlo: Appearances Can Be Deceiving” at the Brooklyn Museum.CreditCreditClockwise from top left, Diego Rivera and Frida Kahlo Archives, Banco de México, Fiduciary of the Trust of the Diego Rivera and Frida Kahlo Museums; Javier Hinojosa, via V&A Publishing (dress and lipstick); Banco de México Diego Rivera Frida Kahlo Museums Trust, Mexico, D.F./Artists Rights Society (ARS), New York; Nickolas Muray Photo Archive; Brooklyn Museum; Brooklyn Museum. 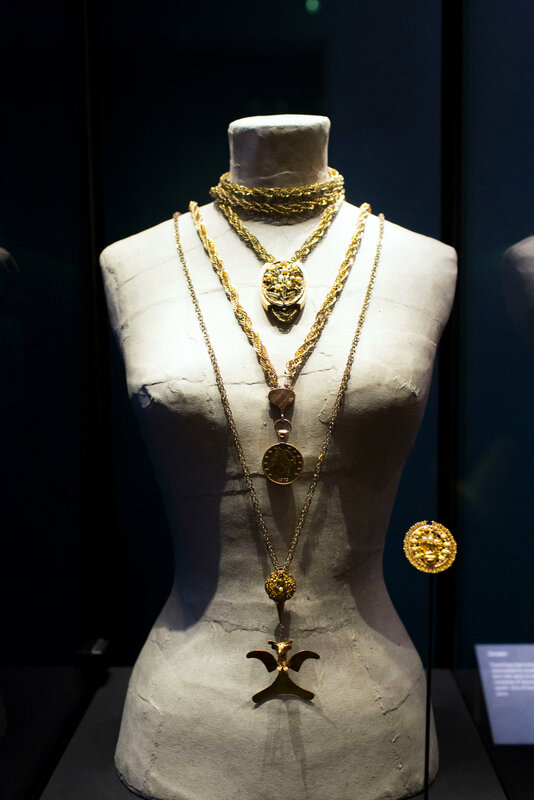 Ms. Kahlo's jewelry included torzales, long woven chains of gold, and pendant necklaces.CreditLauren Fleishman for The New York Times. 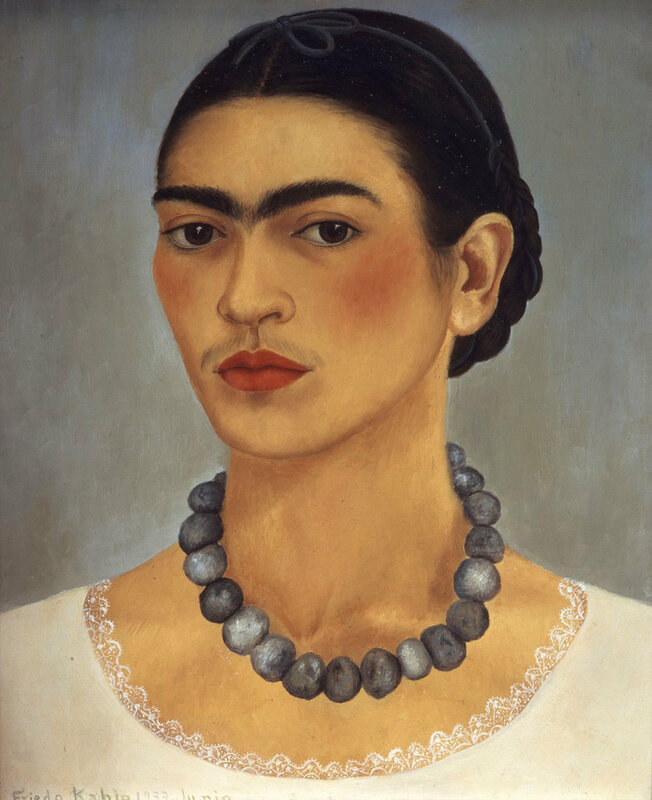 Frida Kahlo, “Self-Portrait With a Necklace,” 1933, oil on metal. 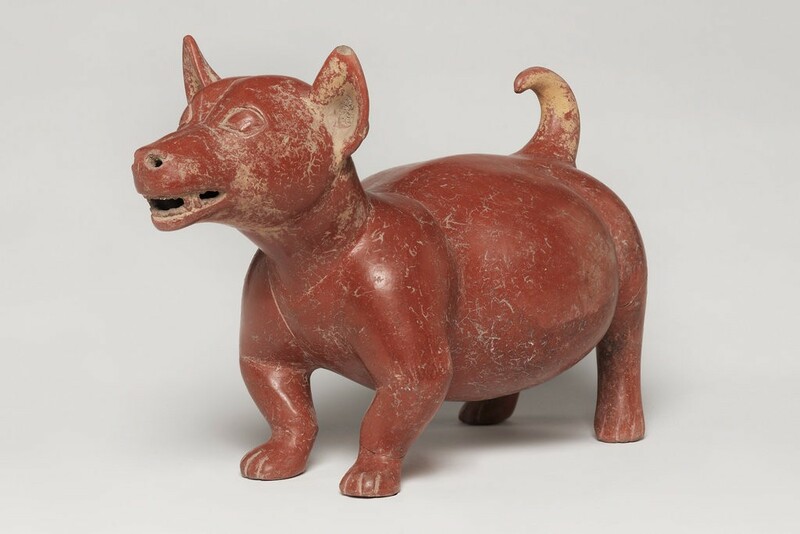 Jade stones in the show are Mesoamerican, from her personal collection.CreditBanco de México Diego Rivera Frida Kahlo Museums Trust, Mexico, D.F./Artists Rights Society (ARS), New York. 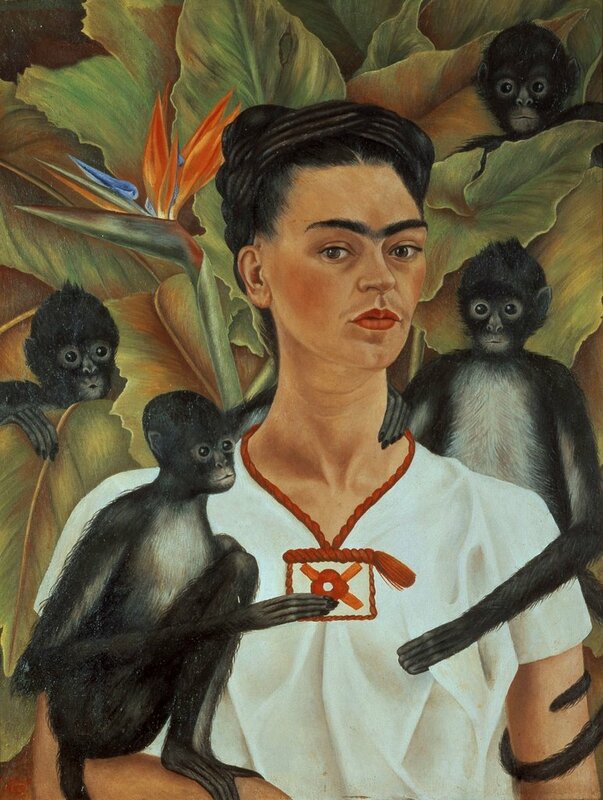 “Self-Portrait With Monkeys,” 1943, oil on canvas.CreditBanco de México Diego Rivera Frida Kahlo Museums Trust, Mexico, D.F./Artists Rights Society (ARS), New York. 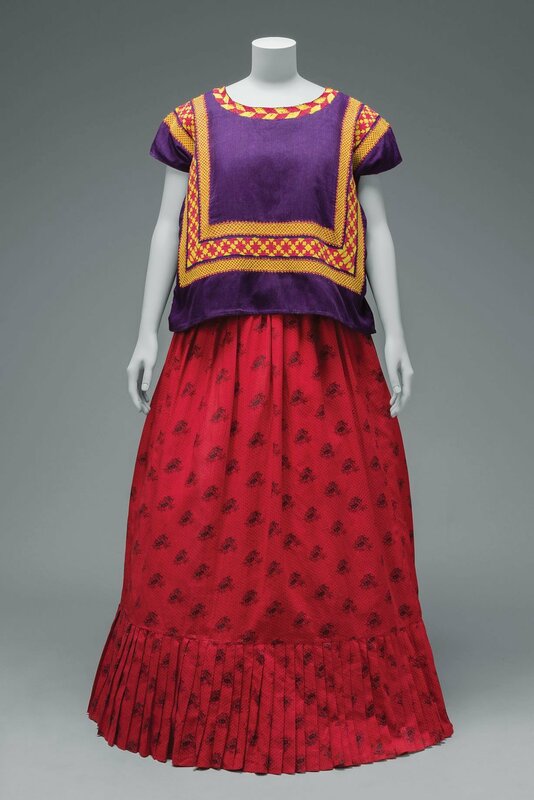 They celebrated Mexico’s indigenous cultures; imbued her frail, damaged body with a powerful aura; and displayed an early grasp of the fluidity of gender and identity. The totality amounted to a continual homage to a defiant multifaceted Otherness that was central to her finely detailed paintings and captured in staged photographs. 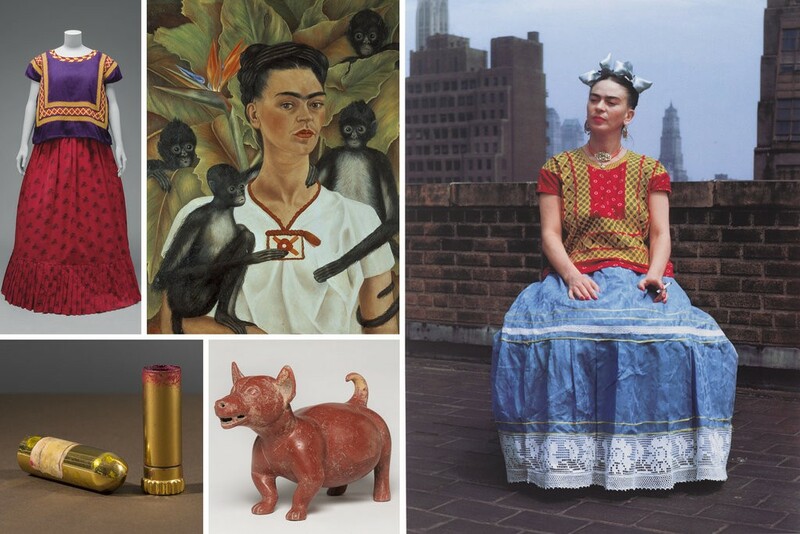 The exhibition in New York will also include examples from Brooklyn’s holdings of Meso-American objects like those collected by Kahlo and her husband, Diego Rivera. 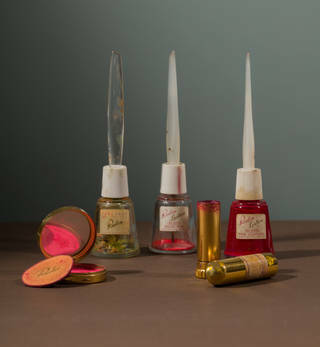 Expect her intense presence and unparalleled sensibility to achieve liftoff. 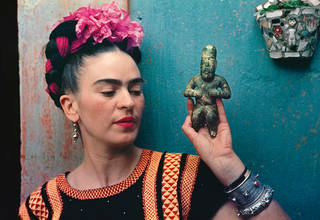 Frida Kahlo with Olmec figurine, 1939. © Nickolas Muray Photo Archives.